At Strictly Ceilings®, we understand the concept of value. Sometimes, the best value for your money is doing a project yourself. With Strictly Ceilings® detailed instructional videos, professional acoustical ceiling installation has never been easier – or more affordable! In these videos, owner and master ceiling installer Timothy Chapel, demonstrates step-by-step how you can complete a professional drop ceiling installation yourself for a fraction of the cost of hiring a contractor. Not sure what tools you will need? Check out our free video on tools of the trade and then shop our online Superstore from the comfort of your own home, and we'll do the legwork for you. From installing basic suspended ceilings to learning advanced tricks of the trade, our How-To ceiling installation video guide has you covered. Contemplating whether a acoustical ceiling is for you? Consider installing a suspended ceiling in your basement or office to block out unwanted sound or hide unsightly pipes, HVAC ductwork, or wires in a stylish manner. Need some design ideas for your drop ceiling? Our photo gallery will give you some creative ideas on transforming your space. If you’ve decided to take on your own DIY suspended ceiling installation project, then you’ve certainly come to the right place! Ordering the best drop ceiling supplies on the market has never been easier. After decades of installing millions of square feet of acoustical ceilings (literally), master installer Timothy Chapel has an advanced, clear-cut vision for how drop ceiling installation tools and supplies should be. Maximizing comfort and effectiveness is a guarantee of every ceiling product Strictly Ceilings® delivers, straight from our Superstore. With nationwide shipping service, why settle for anything less? Check out our drop ceiling product Superstore now! With over 20 years of suspended ceiling installation in Milwaukee, Wisconsin and Illinois, Strictly Ceilings*® and company owner Timothy Chapel has surpassed 7 million square feet of finished drop ceilings. Our experienced crew of professionals install suspended ceiling grid and drop ceiling tile installations on residential homes and basements, as well as countless commercial properties (please view our ceiling installation reviews). We have always taken great pride in the fact that Milwaukee, Wisconsin, & Illinois has chosen Strictly Ceilings® as the best drop ceiling installation company in the area. Working with Strictly Ceilings*® to install your drop ceiling has never been easier. 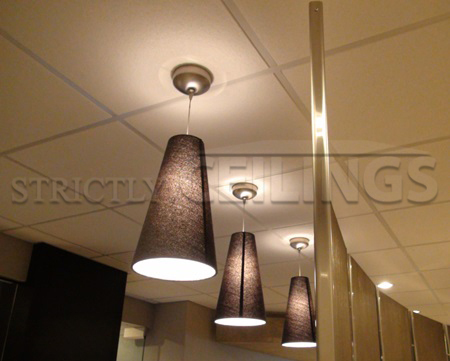 Strictly Ceilings*® has the only online Ceiling Tile Showroom in the world. Our Showroom shows you finished drop ceilings and ceiling tile designs of many popular drop ceiling tiles on the market as well as in-depth professional reviews of each ceiling tile by Master Installer Timothy Chapel himself. Visit our Showroom today. We are proud to display such a high number of prominent clients in our extensive portfolio. Throughout the past two decades, large government operations have repeatedly trusted us to install ceilings in new and existing facilities. An entire school district is a customer of Strictly Ceilings®, as is the Catholic Church, including School Sisters of St. Francis and many others. Other significant commercial projects serviced by Strictly Ceilings*® have directly involved the design and installation of complex ceilings in cafeterias, banquet rooms, and medical offices. Visit our ceiling supplies Superstore and check out our video library for learning the "how-to" of ceiling installation.